Definition: Extension springs are tightly coiled round wires keeping the coils compressed together in its free, unloaded state due to an amount of initial tension gathered between its coils. 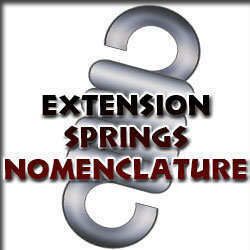 Other term for extension springs. Extension spring’s unloaded length measured from inside the hooks. The extension spring’s body is the section where you have the coils so the body length is the measurement of the body’s length. You may calculate the body length by adding the hook gaps together and subtracting them from the length inside hooks. The length of the gap between the spring’s body length and inner edge of the hook. Most common type of hooks. They are made by bending 75% of the last coil. These hooks are made by completely bending the last coil to the side of the spring’s diameter. The hooks are made from a side hook by making the hook cross the center of the spring’s diameter. These hooks are longer than the hooks you are able to make off of the coils so these must be made directly from the machine to match the length requested by the user/customer. A tension spring without hooks is used when another mating part will play the part of the hooks such as a bolt. The constant amount of force it will take the spring to travel one inch of distance in English measurements = Rate/inch or Newtons per millimeter = N/mm in metric. Length of spring when a load is applied. The maximum safe travel you can achieve if your spring didn’t have hooks. The maximum load possible your spring may undergo if it didn’t have hooks.